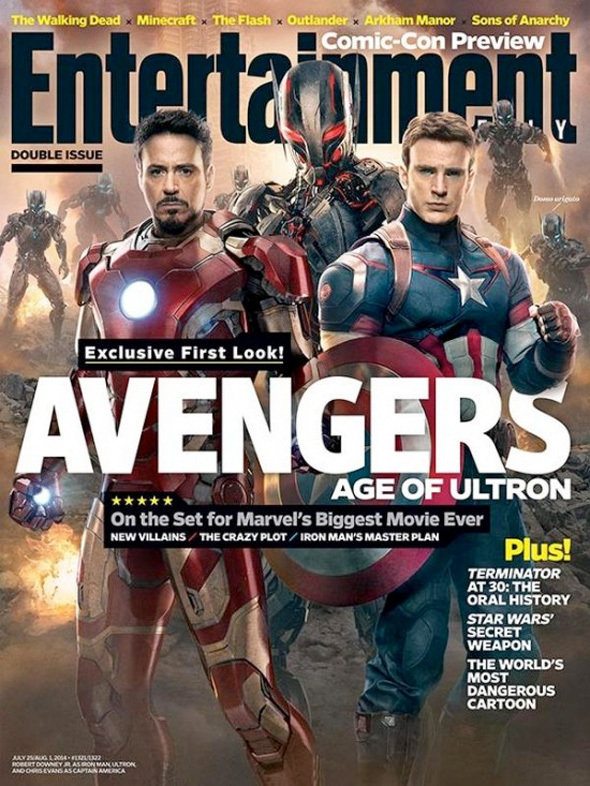 We're bound to get a huge first look at The Avengers: Age of Ultron next week at Comic-Con in San Diego, but until then we have our first look at the titular villain and his robot army thanks to the new cover of Entertainment Weekly. James Spader plays the bad buy, but there's no site of him since Ulton just looks like an alien version of Iron Man. Speaking of which, the cover also features a glimpse at a new suit for Tony Stark (Robert Downey Jr.) and also his patriotic partner Captain America (Chris Evans). Expect some more images to surface soon and plenty more news tom come out of Comic-Con next week. Look now! The Avengers: Age of Ultron is again directed by Joss Whedon, and here's what EW says about the film's plot: "For better or worse (trust us, it’s worse), his Tony Stark has devised a plan that won’t require him to put on the Iron Man suit anymore, and should allow Captain America, Thor, Black Widow, Hawkeye, and the Hulk to get some much needed R&R as well. His solution is Ultron, self-aware, self-teaching, artificial intelligence designed to help assess threats, and direct Stark’s Iron Legion of drones to battle evildoers instead." But of course, that doesn't exactly go according to plan as Ultron is smart enough to figure out that life on Earth would be much easier if human beings weren't messing everything up. Whedon explains, "Ultron sees the big picture and he goes, ‘Okay, we need radical change, which will be violent and appalling, in order to make everything better’; he’s not just going ‘Muhaha, soon I’ll rule!’” The story also adds that Ultron can be uploaded to various locations with ease and he can recreate himself in different forms, making him bigger, faster and stronger, and certainly a formidable opponent for The Avengers. Stay tuned to find out what Marvel shows us in Hall H at Comic-Con next week. Looking good? Ultron Hulk Buster? Yes, please. I was thinking that would be one of the few ways Stark and/or Hulkbuster and the Hulk would get in-to it. That scene could be so great... Ultron design is pretty spot on too. Awesome. Rober Downey Jr., James Spader, who else? Molly Ringwald? I think it's great that some of the greats from the 80's are getting another go around. Where's Anthony Michael Hall? Jon Cryer's got 2 1/2 men, so he's good. Wow I cannot wait for this movie coming from a comic book fan ultron singlehandedly can beat the entire group sweet!! Love seeing Tony in the suit. Hopefully it doesn't turn out to be Iron Man and friends again....well at least they are giving Cap the equal spotlight on this poster but I doubt that if The Winter Soldier movie wasn't successful it would probably just been Iron Man on it. Fun fact: Rogers/Cap actually edges Stark/Iron Man in screen time in the first movie...it was by less than a minute, but still, the 'Iron Man and friends' criticism is perpetuated a bit too much. Stark was also introduced in the film after Banner and Rogers. Granted, he did out-shine everyone in the climax with the bomb, but that was about it. It's insane to think how far we've come in the past few years. The magnitude and sheer size of these films is breathtaking, you almost can't complain but goddamn is it awesome to be in the time that we are in. Just throwing this out there for discussion: How will Black Widow stand up against Ultron or his army? Out of her league? Hopefully she doesn't and is killed in the first 10 or 15 minutes. That scene at the end of Avengers when the camera is spinning around them while posing, and all she can do is put a clip in her little gun. I hate that scene. Plus with all the diverse arrows Hawkeye had in A1, I'm pretty sure he'll have a big variety to choose from to take out the adroid minions. Ultron needs more gaping mouth (phrasing). But seriously, he does. I think he'll have 'gaping mouth' moments/sections in the film. The new armour and uniform look fantastic! Ultron looks like such a BAMF! I can't wait to see what The Vision look like. So ready for this.